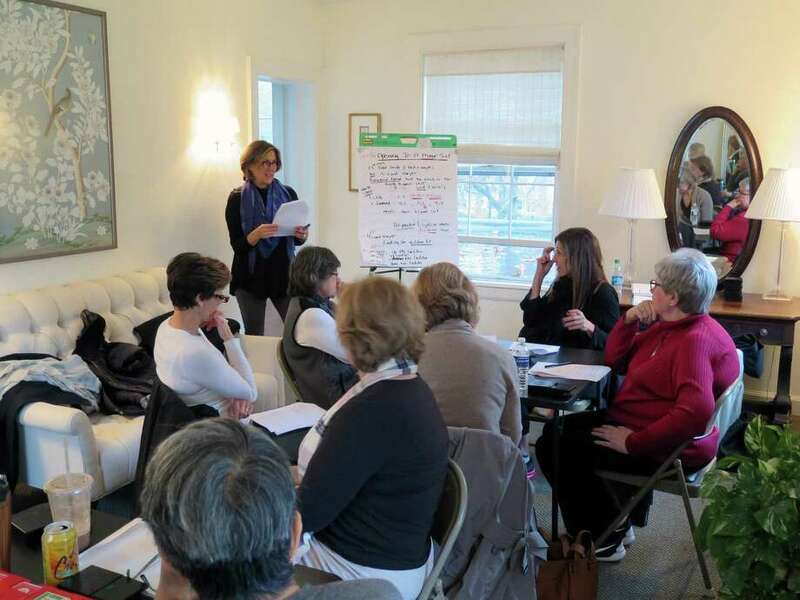 Instructor Meredith Dunne teaches a bridge class at the Darien Community Association. Bridge classes are being offered throughout the months of September and October. The Andrew Shaw Memorial Trust and Darien Boy Scouts invites families to attend the Family Scouting Open House on Sept. 22 between 2 and 5 p.m. at the Scout Cabin, 140 West Ave. There will be hands-on Scouting and STEM activities for children, and parents can get information about programs for boys and girls, grades K-12. Current Cub and Boy Scout programs andthe co-ed high school STEM Venture Crew are starting their new years, and new programs are being built for girls as well. On Sept. 27, the New Canaan - Darien & Rowayton Magazine will present the third annual Darien’s Best Bartender Contest in the town’s scenic Nielsen’s Florist from 5:30 to 7:30 p.m.
Local mixologists will design signature cocktails and entertain attendees, who will have the opportunity to sample drinks prepared with select ingredients and vote for their favorites. The cocktail with the most votes will be featured in the November/December issue of the magazine, along with photos of guests and competitors. Darien’s Best Bartender Contest will also feature live music and seasonal light bites prepared by chefs from a variety of local restaurants and caterers, including The Water Edge at Giovanni’s, Center Street Public House, Louie’s Italian Restaurant and Bar, Michael Joseph’s, Rory’s Restaurant and The Goose. Wine will be provided by Valor Spirits, and water will be provided Mountain Valley Spring water. Drinks and nibbles will all be served in Nielsen’s Florist, at 1405 Post Road, Darien. Limited tickets are available for the contest. Price is $25 for each ticket purchased prior to the event. Cost is $30 at the door. To buy tickets in advance, visit NewCanaanDarienMag.com. The Thriving Youth Task Force, the Darien YMCA, The Community Fund of Darien an the Darien Youth Commission invite the public to celebrate Family Dinner Day, a national initiative spearheaded by the National Center for Addiction and Substance Abuse at Columbia University. Family Dinner Day will take place on Sept. 21 from 6 to 7:30 p.m. at the Darien YMCA, and is free. For additional information regarding Family Day Dinner, visit www.casafamilyday.org. The evening includes dinner, swimming, open gym, arts and crafts, games, goodie bags and an evening of fun for the whole family. Space is limited so reservations are required. While this event is open to all, the focus is on families with preschool through elementary school children. RSVP by Sept 19 by emailing youthcommission@darienct.gov, with “Family Day Dinner” in the subject line. In the body of the email, include family name and number (and names) of family members attending. An acknowledgement of receipt of your reservation will be emailed back. For additional information, contact Alicia Sillars at asillars@darienct.gov. The Darien League of Women Voters will open its fall season with a presentation by Aleksandr Troyb on the topic, “Myth - Busting: Immigration Today.” The program will take place on Sept. 20 at the Wee Burn Beach Club, 6 Anchor Road, Norwalk. A cash bar will open at 6:30 p.m., with dinner at 7 p.m., and the speaker to follow. Troyb is an attorney with the law firm Benjamin, Gold and Troyb in Stamford, where he advises clients on immigration law and regulations. He serves on the executive committee of the Fairfield County Bar Association. He is also a committee co-chair of the Connecticut Chapter of the American Immigration Lawyers Association. He represents clients in state and federal courts and regularly represents clients before the U.S Citizenship and Immigration Services and the Board of Immigration Appeals. Troyb’s presentation will separate the facts on immigration from fiction and discuss the problems faced by individuals, families and businesses in coping with our complex immigration system. The cost of the dinner for League members is $45 and for guests $50. RSVP with a check to Sandy Filmer, 10 Harriet Lane, Darien, CT 06820, or email sandyfilmer@gmail.com. For information on the Darien League or to pay online, visit lwv.darien.org. Homeschool students can explore the marine world in a new weekly series of standards-based programs utilizing the educational resources of the Maritime Aquarium at Norwalk. A “Marine Animal Adaptations” series for ages 7 to 9 and a “Marine Biology” series for ages 10 to 13 will meet on Monday mornings from Sept. 24 to Nov. 12. Each session in the eight-week series runs from 9:30 to 11:30 a.m. Times may vary on the days of a coastal beach exploration and a study cruise onto Long Island Sound. “Marine Animal Adaptations” will explore the relationships between structure and function in a variety of marine animals, including sharks, squid and a host of invertebrates observable only through microscopes. Students’ investigations into behavioral adaptations will include the cruise out on the aquarium’s research vessel to consider the adaptations of animals found in Long Island Sound. Class size is limited to 15 students. The “Marine Biology” series will delve into such topics as marine biodiversity, water-quality monitoring, fish anatomy, conservation and more. Additionally, students will go behind the scenes of the aquarium to learn about the diverse careers needed to operate a modern aquarium, and also will collect data about animals and water quality during the cruise out on the Sound. Class size is limited to 20 students. Cost of each series is $275 ($250 for aquariummembers). Deadline to register is Sept. 19. Get details and sign up at www.maritimeaquarium.org/homeschool-students.